Do You Need to Invest in Window Coverings for Your Weston, FL Property? Is the appearance of your Weston, FL property being affected by the poor-quality window coverings? If your blinds are old and run down, then they could be dragging down curb appeal and leaving the wrong first-impression for visitors. Instead of living in a home that is old and in need of repair, consider the advantages of investing in new shades, shutters, or blinds. New window coverings are a great investment for your home for several reasons. Not only will you change the appearance of your property, but this investment will also impact the function of your home as well. If you want to create the home of your dreams, then window coverings need to be on your to-do list. Our team at Open House Interiors is here to provide the best products in the industry. We know what it takes to install beautiful, durable coverings on your windows. As you learn more about our company, you will see that we are focused on the satisfaction of our customers. You can rest assured to know that you are receiving the best products when you buy from us. There is no need to spend money on major renovations if you want to change the style of your property. A few small upgrades can go a long way to integrate a modern design theme that will look trendy and welcoming. 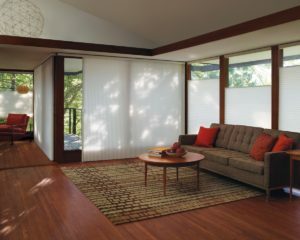 Window coverings play a role in the overall design of each room. Consider how the coverings will tie in with the furniture, wall hangings, and other stylistic features. The type of shades, shutters, or blinds that you choose should coordinate with the other interior décor elements in your home. For example, if you want to create a luxurious living space, then consider upgrading to shutters. These products are beautiful and classic, giving you long-lasting style that will look great. Or, you could install shades that will bring a pop of color into the room to complete the design that you have created. Privacy is a big concern for many people, especially if there are neighbors near. How can you relax if you feel like the neighbors are looking inside? You deserve to enjoy your home without the prying eyes of other people outside. Blinds, shutters, and shades can be opened or closed depending on the time of day and your preferences. Many homeowners choose to open the window coverings during the day to enjoy the sunshine. Then, they can be closed in the evening if you want to relax without people seeing inside. There are other options for privacy while still enjoying the sunshine. You can choose to open the blinds or shutters partially, covering the immediate view without blocking all the sunlight. The way the slats are positioned will determine the view into your home. Test different options to find the solution that matches your preferences. One problem with cheap blinds is that they are often damaged, bent, and broken over time. If you have old window coverings in your home, then they probably look old and run down. There is no reason for you to live in a home that needs to be repaired! Also, consider the potential damage or injury that can occur from old blinds and shades. Children or pets could accidentally knock the old window coverings off the wall. Or, loose cords could be a danger for strangling if the child is caught while playing. These problems can be avoided by upgrading the window coverings in your home. Consider the way the products will be used. Then, pick the materials and features that will suit the needs of your family. The quality of your installation team will have an impact on the overall results that you can expect. If you want high-quality window coverings, then you need to make sure that you choose a company you can trust. Your contractor will have a direct result on the quality of the materials that are installed in your home. Take time to compare your options. Choose an installation team with many years of experience and a great reputation. Don’t hesitate to spend a little more money to ensure that you get products that will be durable and beautiful.